It’s not like it’s a big deal or anything, it’s just a footnote, a detail — but God is in the details, the devil is in the details. And it looks as though a certain Twitter account does belong to the Taliban after all. 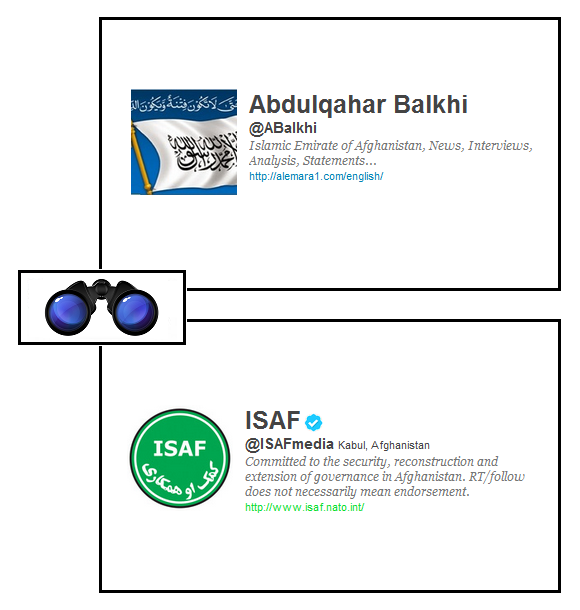 I wasn’t the first or last to make the connection between A Balkhi and the Taliban, nor to note the Twitter-exchanges between Balkhi and the ISAF press office — but I happened to have this habit of juxtaposing similars and opposites, and had developed the “Specs” format used here, with the little binoculars inset, to suggest the idea of seeing parallel or opposite things in parallel or opposition — a sort of mental equivalent of stereoscopic vision or stereophonic sound — in the hope that something about the comparison and contrast would add a depth dimension to understanding. When two things are so much the same and so utterly different that, as with a Necker Cube (or the positive and negative of a photo rapidly alternating) the mind flashes rapidly from one view to its exact and opposite other, a metacognitive insight arises about what I can only term the two in one in twoness experienced. File that under number theory, koans. But that’s about metacognition, let’s get back to the Taliban on Twitter. No. Just no. The account @abalkhi appears to have nothing to do with the Taliban (see below). I’d also be interested to see the evidence for the statement that ‘Taliban spokesmen also frequently spar with Nato press officers’. I have not seen a single instance of this. Every other story on these accounts repeats this claim. And it’s presumably quite an important distinction: an official spokesman (we might assume it is a man) engaged in verbal attacks on the official ISAF account is a different thing from some fanboy in his bedroom doing the same thing. Today, Alex (I hope that’s the appropriate way to name him) reversed himself with the tweet featured at the top of this post. The pool of people to whom it matters whether A Balkhi is an official Talibvan site or a fan site is probably quite small, and by now they will all surely have either read the Wall Street Journal, seen Alex’s tweet, or arrived at whatever conclusion in the matter their own intelligence sources have suggested to them. In the enormity of cyberspace, then, this whole post of mine is just a footnote to a footnote. Alex’s piece from which I quoted above, on the other hand, is a true footnote: it provides us with a decent summary of Twitter-feeds associated with the Taliban, helpfully annotated. Let’s call it a benchmark – and while this business about A Balkhi may be just a detail, benchmarks are go-tos, and I hope Alex will update his.